Counseling Theories will help students and professionals “find their theories” and enable them to become congruent in theory and practice. This volume addresses specific applications with young populations and emphasizes the application of concepts to group and classroom settings. Leading experts in the field collaborate with practicing school counselors to contribute to each chapter. They address individual, group, and classroom applications as well as how to work with parents and teachers and how to adapt applications to multicultural environments. 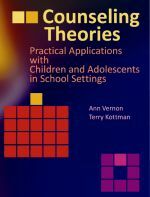 Each chapter concludes with a discussion of two case studies, one with a child and the other with an adolescent, to illustrate how to address the same problems from multiple theoretical perspectives.